#550+ Large Crafting Table • Features moulding and upgraded options! How does Gristmill’s Large Crafting Table differ from the Small Crafting Table? The Large Crafting Table gives you more surface area for your cutting, sewing, and quilting projects. This collapsible sewing table has wings that fold out to form a tabletop measuring 37” by 74”. A table more than six feet long can be used for many projects other than crafts and sewing! Do you need a spot for the puzzle you like to put together in the evenings with your family? Are you an artist who needs a place to spread out your drawing and painting supplies? Would an extra table be handy for playing games when company comes Sunday afternoon? 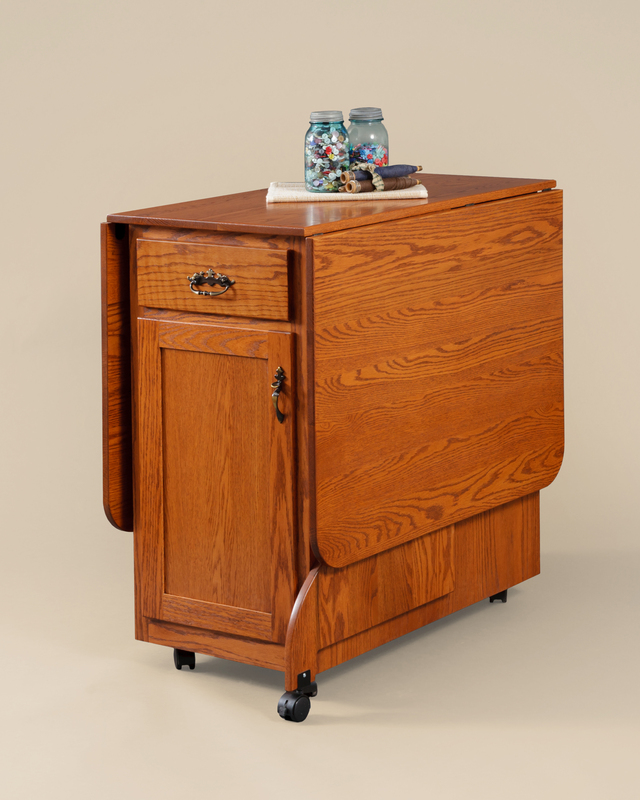 You will love the mobility of this craft room furniture! Sturdy wheels allow you to roll the table to the spot of your choice. When finished with your craft project, puzzle, drawing, or game, collapse the sides of the table and roll it back to its home! Everyone is looking for storage to keep their tools and materials out of sight. 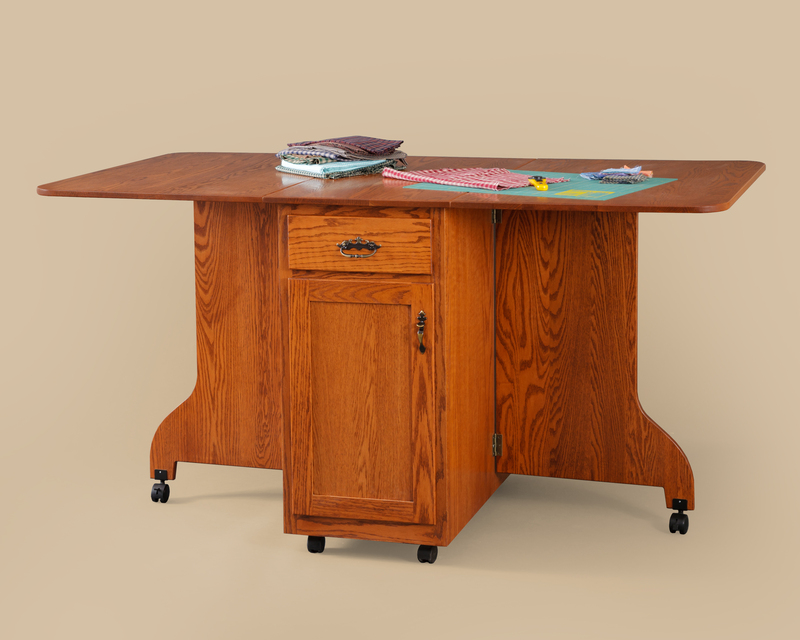 The Large Craft Table has two drawers, one that opens from the front and one that opens from the back. The drawer sizes are 11 ⅝” wide x 14 ⅝” deep x 3 ¼” inside height. 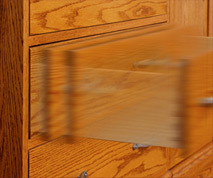 If you order the drawers with the undermount soft close drawer slides, the drawer dimensions vary slightly. 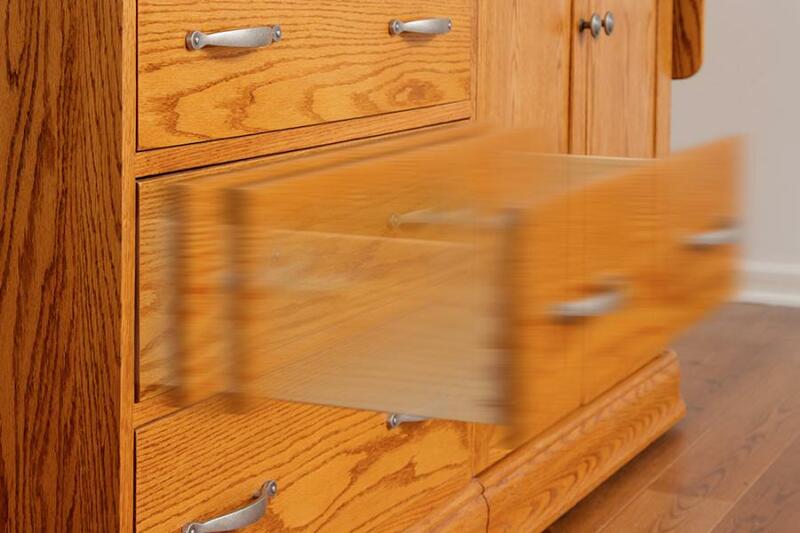 The sizes of the drawers change to 12 ⅜” wide x 13 ⅝” deep x 3 ¼” inside height. The front and back of the cabinet each have a door that opens to reveal more storage. Unlike the Small Sewing Table, this one does not have a divider through the middle of the cabinet. This gives you a space that is 32 ¼” long by 15 ¼” wide. Now you have a spot to store large patterns or long rolls of fabric! The cabinet includes an adjustable shelf, so you get to decide what height you need for your supplies! Pictured above is the #550+ model with the beautiful base moulding and the crown raised panel door. Both features are a benefit of ordering the plus model. We enjoy customizing our folding sewing table to your specifications. 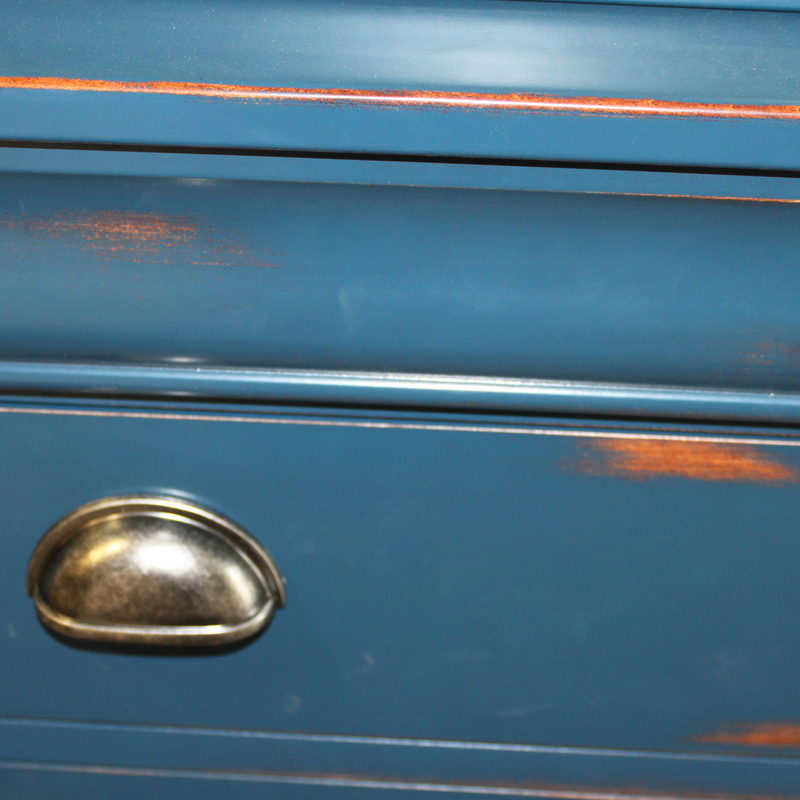 We have lots of options to choose from including a variety of stain and paint colors, distressed finish, hardware designs, and soft-close drawers. Visit our Options Page to see photos of what we offer! • Dimensions on photo shown – W 21.5 in. (74 in. Open) x D 37 in. x H 35 in. Large Crafting Table Plus in open position in oak in traditional style and Lynford stain.